You will also need a thick glass bowl/jar with a tight-fitting lid and a thermometer. Thicker glass will retain the temperature better. 1. Heat milk on medium-high in a pot on stove until it comes to a boil (stir occasionally or keep covered to prevent a film from forming on top). Remove from heat and pour into a glass container with a lid. 2. Allow the milk to cool to about 90*C-110*F (the outside of the glass container should feel warm but not hot). Loosely place the lid on top while cooling to prevent a film from forming, or stir occasionally. If you let it cool too long and the temperature drops lower just reheat on stove until it reaches the right temperature again. Add a teaspoon of the starter culture* to the centre of the warm milk (do not stir!). Make sure the lid is on tight and place in cool oven. 3. Turn the oven light on (the warmth from the light will keep the milk warm enough to allow the fermentation process to occur). Let sit overnight or about 8-10 hours, then cool in the refrigerator before eating. 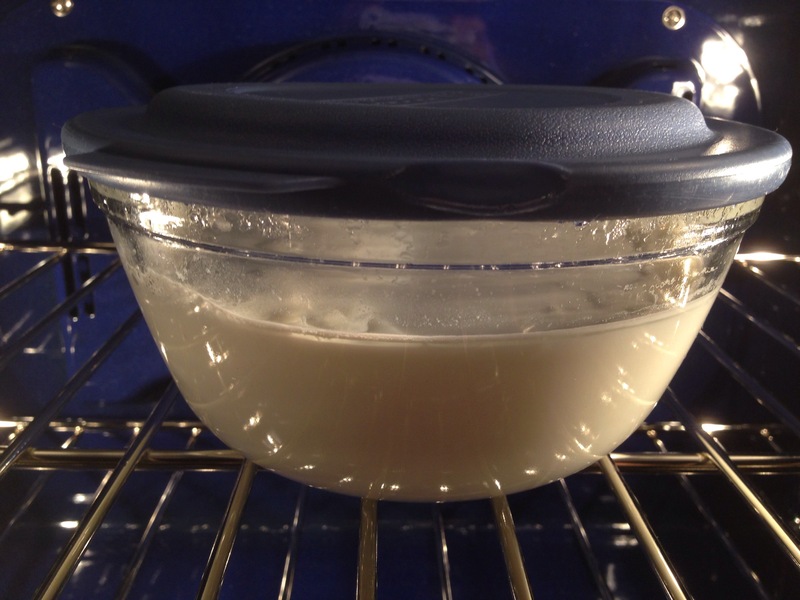 If the milk does not solidify or seems runny, simply leave it in the oven with the oven light on until it thickens. 4. Remove the whey (the runny liquid floating on top of the yogurt) before refrigerating and save it for lacto-fermentation of other foods. Or discard it. But now that you’re a pro fermenter why not save it and try your hand at another fermented food 😉. *You can buy a powdered starter culture or simply use previously made or store bought yogurt as a starter (if using store bought yogurt make sure it is plain). Each time you make yogurt, set aside a spoonful before you eat it all to use as a starter for the next batch. Or you can do what Indians usually do, and ask a relative, friend, or neighbour for a little bit of their yogurt to use as a starter. If you do not plan on making continuous batches of yogurt then you can also freeze some to use as a starter later (if using frozen starter use a tad bit more than a tsp). 1. Your yogurt turned out too sour. You either used too much of the starter or added the starter when the milk was not cool enough. Use less starter and make sure the milk is at the right temperature next time. If you prefer a more sour taste then use slightly more starter than stated in the recipe. 2. Your yogurt didn’t solidify. You either used too little starter or allowed to milk to cool too much. Don’t fret – just keep it in the oven with the light on (do not turn on the oven!) and let it sit longer. Use a tad bit more starter next time and make sure the temperature of the milk is right. 3. You forgot about the yogurt and it incubated for too long. Don’t worry. It simply fermented longer so it might be a little more sour than usual but it’s still OK to eat (some people incubate their yogurt for up to 36 hours). 4. You ate all the yogurt and forgot to save some to use as a starter for the next batch. This one requires a preemptive solution – freeze a little bit of your first batch of yogurt to use in emergencies when you or another family member eats it all. 5. Even after following all of the above tips your yogurt still did not form. You may have disturbed the milk too much by either stirring or jostling it, or removing the lid to check on it too frequently. Once you add the starter and place it in the oven, LEAVE IT ALONE! The more you disturb it the less likely it is to form into yogurt. 6. Your yogurt has become increasingly sour/tart over time despite your best efforts to do everything right. You need a fresh starter culture. Using sour yogurt to make more yogurt will only result in endless batches of sour yogurt. You can eat your yogurt plain or add fresh fruit, honey, granola, or other topping of your choice.